iTunes Seller:Seller: iTECH DEVELOPMENT SYSTEMS INC.
PDF Reader Pro Edition for iPad is optimized specially for the iPad. Now with Annotations and highlight support and with the latest update PDF forms support!! Also multitasking and printing (Need iOS 4.2). A really powerful and optimized PDF reader engine. PDF Reader Pro Edition is the most powerful PDF Reader available for the iPad. You can easily transfer your PDF files to your iPad from your computer or directly from a website. Now you can transfer all your PDF files using the USB sharing feature!!! Transfer your email attachments from your email to PDF Reader Pro Edition for iPad. - Search capabilities( you can easily find any word on your PDF file). - Jump to a specific page. -open password protected PDF files. -Document Manager(copy,cut, paste and delete). -Upload/download PDF files directly from the Web. -Remember last position when open a PDF file. -Scan Option available to create multipage documents in PDF format. -Rotate function (you can rotate a single page or the whole document). -Full Web browser to download PDF files from the web. -Extract and email pages from a PDF file. -Create a new PDF file using pages from an existing file. WHEN USING THE FULL SCREEN MODE TAP WITH 2 FINGERS TO ENABLE/DISABLE FULL SCREEN MODE. 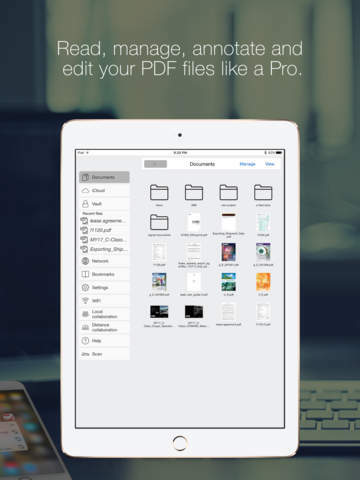 Now all PDF Reader Pro Edition for iPad customers can download PDFSync for Mac for free. Thanks to PDFSync for Mac all PDF Reader Pro Edition for iPad users can move, copy and manage entire folders and folders structures directly from your computer to your iPad. With PDFSync you can easily manage all your folders directly from your Mac and all the changes you make are automatically synchronized the next time you connect your iPad to your Mac, all your files are always up to date and available on your Mac and iPad. If you have any problems with installation or in-app purchase, found bugs, questions, comments about this application, you can visit the official website of iTECH DEVELOPMENT SYSTEMS INC. at http://www.itechdevelopmentsystems.com/pdf-reader-pro-edition-for-ipad_1_1_s_7_15.html. Now you can easily copy and move text from your PDF files to another app. Drop text from any app to add it a text annotation to your PDF file. Now you can easily drag PDFs from your email and other apps in and out of PDF Reader Pro Edition. • Performance enhancements. This update contains stability improvements. • More features coming soon! Using free drawing and free highlight has never been better. Now thanks to the amazing technology inside the Apple Pencil you can draw lines of any weight by just applying pressure. Press harder to draw thicker lines or just a gentle touch for wispy hairlines. 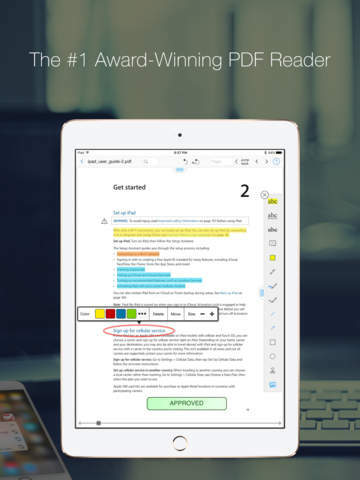 Now you can read, annotate and work with your PDF files while you work on other apps. Using free drawing and free highlight has never been better. Now thanks to the new 3D Touch technology you can draw lines of any weight by just applying pressure. Access your most recent files instantly from your home screen (iPhone 6s and 6s Plus). Spotlight Search helps you find and open your PDF files directly from your Home Screen. Now you can save a Flatten copy of your file without having to email the file. Performance enhancements. This update contains stability improvements. The biggest update is here!! •Fresh new user interface specially design to merge beautifully with iOS7. •Real-time online collaboration & chat. Now you can collaborate and add annotations with other users on the same file over the internet in real time and you can chat about your progress simultaneously. They will be able to see what changes you are making as you make them all in real time. •Performance enhancements. This update contains stability improvements. •compatibility update for iOS 6 users.